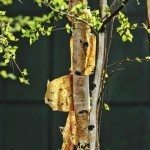 The bark on my tree, believed to be an Ash, just started to fall off on one side from the ground to about 18 inches up and approximately 9 inches wide. It seems to be getting worse as it sets. I noticed an article stating to put the loose bark back on with duct tape to seal off the area. Is that all I do, or is there more procedures to look for?